The April TGO magazine, just published, is a special gear issue. It’s not however full of long lists of gear. In fact there are no lists at all. Instead there are masses of gear reviews, trip reports of how gear performed and interviews with outdoors people about the gear they use. There’s also a piece I wrote on the ethics of outdoor gear, which was an interesting piece to research and write and more encouraging than I initially expected. Other work of mine in this issue is a trip report on new gear used on a high camp in the Cairngorms (GoLite Xanadu 1 tent, MontBell Ultralight Super Stretch Down Hugger #3 sleeping bag, Primus EtaExpress stove, GoLite Trail Fly shoes & Mountain Equipment Compressor insulated jacket – all items shown at the Friedrichshafen show a few months before the trip), a trip report on the gear used on my Yellowstone ski tour last year (much of which was used again on this year’s trip), a piece on safety and lightweight gear in which I argue that the latter can be just as safe as heavy gear and eleven gear reviews including the FurTech Talon jacket, Baffin Mountain Boots, GoLite Shangri-La 3 shelter, Wild Country Sololite tent and the Inkapen. Small items are important too! There’s much else by other people too including Cameron McNeish’s latest contribution to the Alladale estate proposals, which I’ve commented on in several blog entries. The issue is introduced by Cameron in a short video on the TGO website. 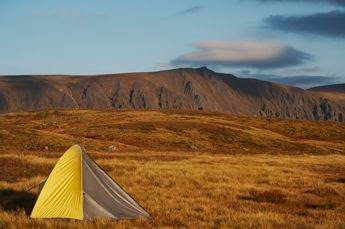 The picture shows the camp on the Moine Mhor during testing for the “High Camp in the Cairngorms” TGO feature. Photo info: Canon EOS 350D, Canon EF-S 18-55 mm @ 55mm, f8@1/500, ISO 200, raw file converted to JPEG in Capture One Pro. 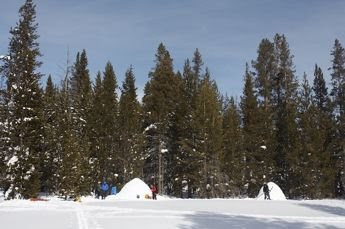 Deep snow, smoking rivers, geysers throwing water and steam high into the freezing, sparkling air, bubbling mud pots, magnificent old growth forest, winding canyons, vast pristine meadows – Yellowstone National Park in winter is a very special place, which is why I returned there last month for a second year’s ski touring and igloo building. For ten frosty nights I marvelled at the enormous starry skies, the brilliant waxing moon and the dark outlines of the forest before retreating to the cosy (really!) confines of an igloo for hot food and a comfortable night’s sleep. During the days our party of five skied through the forests and meadows, towing our gear on pulks between igloo sites, and touring with light daypacks from the igloos. We ventured down steep-sided river canyons, explored remote thermal basins and wandered across little-visited meadows. Eleven days of refreshing wilderness and natural beauty. Shoshone Geyser Basin was weird and wonderful, coloured thermal pools and steaming bare ground lying beside snow covered meadows below trees and rocks thickly coated with the frozen damp air from the thermal features. Lone Star geyser blasted water and steam high into the air at three hourly intervals, a display we could watch from outside our igloo. The high meadows at the headwaters of the Firehole river were quieter and more subtle, rippled white fields stretching for miles between dark forests to the final cliffs above Madison Lake. To reach the meadows we skied through silent groves of giant Engelmann spruce and subalpine fir, tremendous trees soaring into the sky. Wildlife was scarce in this harsh snowbound land but we were visited by foxes and pine martens, intent, sometimes successfully, on raiding our food supplies. One pine marten bravely ventured into our igloos while we were away, showing a great liking for chocolate. At another site a less bold marten hissed and chattered at us from a pine tree. Coyote tracks were everywhere but we never saw one of these wild dogs. Gray jays and Clark’s nutcrackers visited every igloo site, on the lookout for any scraps of food. Surprisingly, one of the commonest birds we saw were mallard ducks, which were often encountered in the creeks and rivers, open despite the bitter sub zero temperatures due to the warmth from the thermal features. 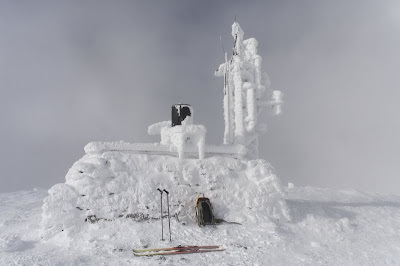 Ski touring in winter Yellowstone was a deep wilderness experience, an immersion into a wild, natural world. It will live with me for many years. 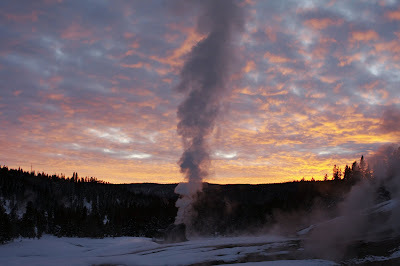 The picture shows the Lone Star geyser erupting just after sunset. Photo info: Canon EOS 350D, Canon EF-S 18-55 mm IS @ 29mm, f8@1/30, ISO 100, raw file converted to JPEG in Capture One Pro.